UPDATED: Sun., March 24, 2019, 10:45 p.m.
MOSCOW, Idaho – Given the opportunity to send Idaho’s Splash Sisters out with a memorable farewell Sunday, a crowd both large and loud nearly filled Memorial Gym. The only empty seats were a bank of concrete bleachers high above a basket that probably hadn’t seen a backside since Gus Johnson was defying gravity for the Vandals in the early 1960s. Seniors Mikayla Ferenz and Taylor Pierce responded with a suitably epic splash. 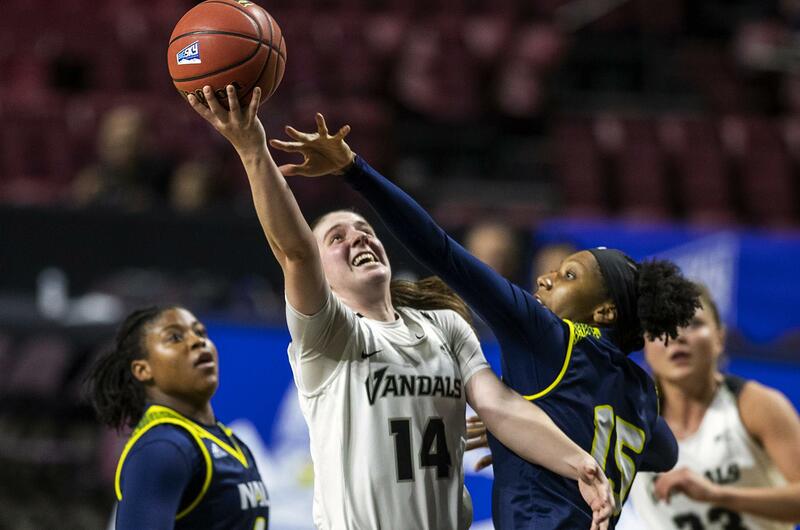 They keyed a third-quarter comeback that saw the Vandals outscore Denver University 36-9 and sprint away from a nine-point halftime deficit to an 88-66 victory in a second-round Women’s National Invitation Tournament game. Idaho will play at Arizona in a third-round game on Thursday night. Ferenz scored 20 of her game-high 33 points in the second half. After hitting just one of four 3-point attempts in the first half, Pierce lit up the Pioneers with 4-of-6 shooting from behind the arc the rest of the way. The 1,230 in attendance adored it. Afterwards, as the Vandals milled around the court waving to their fans – who all seemed intent on savoring the moment and refused to leave – coach Jon Newlee grabbed a microphone. “Thank you so much. It meant the world to these girls. This has been the most fantastic experience we’ve had,” he said. He also thanked departing UI president Chuck Staben for green-lighting a bid to host the game. “In this tournament, it’s so crucial to get a home game,” said Newlee. All four quarters went off at a furious pace. Both teams played with the intensity of knowing somebody’s season was going to end. Like Idaho, the Pioneers are happiest when they are hoisting treys, but the Vandals held them to just 3-of-7 from beyond the arc in the first two quarters by refusing to be deterred by the ball screens with which Denver tried to shelter its shooters. However, Denver responded by going inside. Idaho took a momentary lead when Gina Marxen hit a 3 after running down the opening tip-off. From there, though, the Vandals played behind as Denver outscored Idaho in the paint 28-14. “We were taking away the 3, but they were getting to the rim,” said Newlee. The Pioneers also owned a 23-9 rebounding edge. Newlee addressed both concerns in the locker room. Idaho responded with a 16-3 run to open the third period. “It started with our defense,” Ferenz said. “The third quarter has always been our quarter.” The Vandals were never threatened again and led by as many as 23 points. Others came up big for Idaho. Hailey Christopher grabbed six of her seven rebounds in the second half, and she turned two of them into assists on 3-pointers. “I told her if you see a rebound, get in there and rebound the basketball. She took it to heart,” Newlee said. Natalie Klinker led with nine rebounds, as the Vandals ultimately controlled the glass, 38-34. Marxen, a freshman, showed herself to be a worthy Splash Sister successor with 16 points, including 4 of 6 on 3-pointers, and six assists. Madison Nelson and Samantha Romanowski led Denver with 19 and 11 points, respectively. Nelson grabbed six rebounds. The crowd got some halftime inspiration as the 1986 WNIT championship trophy Idaho won and a couple of the team members who won it made an appearance on court. And Newlee said Idaho might get to see the Splash Sisters one more time. Published: March 24, 2019, 7:29 p.m. Updated: March 24, 2019, 10:45 p.m.